With both the Dow Jones Industrial Average and the S&P 500 Index hovering just below major trend line resistance levels, the Dow Jones Transportation Average (DJT) continues to push to new highs and well above former “channel top” resistance. Importantly, this upward movement in transportation stocks is very positive for equity prices in general since a key element of Dow Theory suggests that transportation stocks usually lead the industrials to higher levels as economic activity improves. Although overbought conditions are clearly present on all three indices at the moment, near-term corrections are always possible on each. Nevertheless, key trend line resistance on the DJT average currently sits at 9,515 and rises over time. That represents a potential 24% advance above current levels. 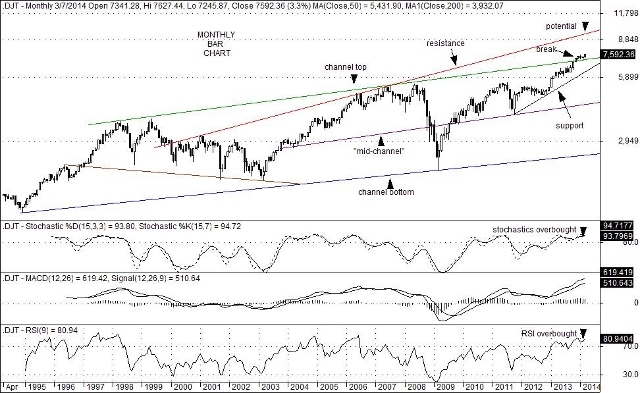 It does not mean, however, that a move up to the 9,500 area is likely to emerge anytime soon, but it does represent an underlying optimism in equities that persists. At this point in time, geopolitical and weather related issues continue to cloud future expectations for growth. That, in turn, has held trading volumes within a normal or even muted range. Still, another facet of Dow Theory suggests that rising equity prices are usually accompanied by rising trading volumes which act as a confirmation to the prevailing bullish trend. As a result, it would not be surprising to see a rise in trading volumes if and when the Dow Jones Industrial Average and the S&P 500 Index break above their long term trend line resistance levels currently sitting at 16,677 and 1,885 respectively. This entry was posted on Thursday, March 13th, 2014 at 3:54 pm	and is filed under Dow Jones Transportation Average (DJT). You can follow any responses to this entry through the RSS 2.0 feed. You can leave a response, or trackback from your own site.